the Chorale performed a mixture of sacred and secular works as part of a Spring Celebration. and The Ground from Ola Gjeilo’s Sunrise Mass as well as some traditional Easter Hymns. Secular works included The Seal Lullaby by Eric Whitacre, Trade winds arranged by Richard Fox as well as various traditional folk songs. The programme also included a number of poetry readings. Saturday January 19th at 3.00p.m. at Christ Church, Wellington. 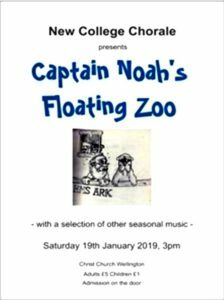 Captain Noah and his Floating Zoo along with traditional carols. 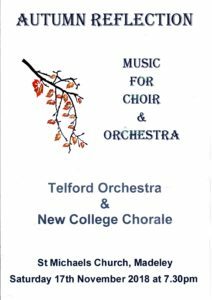 The Chorale teamed up with the Telford Orchestra in a Autumn Reflection. expressive Mother of God by John Tavener. performed by the Orchestra and Chorale. Are you brave enough to fight ? Let’s go looking for the fight ! Still you’re brave enough to fight ! Show them we can really fight ! Aren’t you brave enough to fight ? New college Chorale ended the current season with a concert in Christ Church on Monday June 11th. 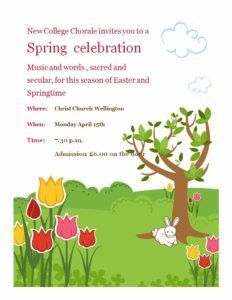 Music included favourite pieces from our current repertoire, including O Magnum Mysterium by Lauridsen and Magnificat by Pachelbel. 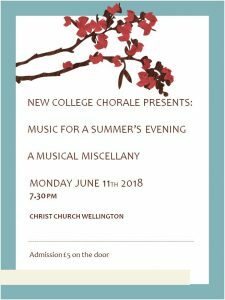 The Chorale also performed some new pieces appropriate for a summer’s evening and some well chosen poems to complete the miscellany. We still have several conductors but Andy Slater is taking the leading role with John Soper in support and Bob Wysome contributing at the planning stage. 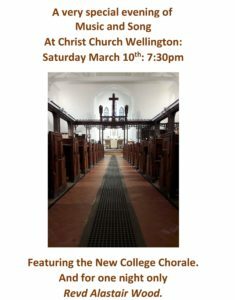 The chorale performed music by Mozart, Rutter and others as well as lesser known modern composers Bob Chilcott and Norwegian composer Ola Gjeilo. Members of the chorale also performed arrangements of Van Morrison’s Moondance and Andrew Lloyd Webber’s Pie Jesu. The New College Chorale performed an evening of music with which to say goodbye to the Revd. Alastair Wood who is moving to pastures anew in Wiltshire. The Revd. Alastair Wood reciprocated with a performance of some of his own compositions to the delight of all. A mixture of sacred and secular music for Christmas including works by Vaughan Williams, Malcolm Archer, John Rutter, and Morton Lauridsen. A short concert by New College Chorale to revisit the contemplative mood and emotions of Remembrance Day 2017.The programme will include music by Purcell, Vaughan Williams and John Ireland and will also include performances from the Chorale Brass Quartet. Admission is free but there will be a retiring collection. A short, contemplative programme featuring Allegri’s Miserere and Karl Jenkins’ Requiem. The choir will be accompanied by a small orchestra. The programme takes the traditional form of nine lessons and carols. This is an unticketed, free event. 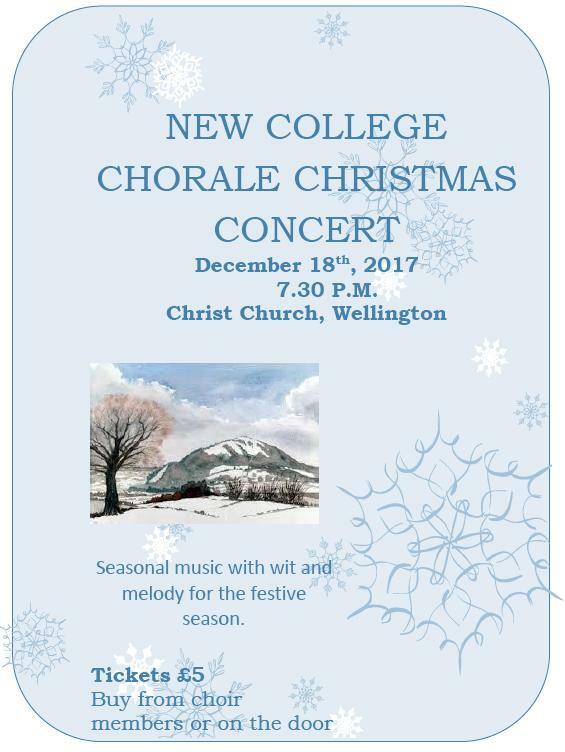 Join New College Chorale for our main Christmas concert. ‘Gaudete’ to ‘White Christmas’, from Vivaldi to ‘Mary’s Boy Child’ as well as the first performance outside London of ‘Mr Lear’, an entertainment by Alan Bullard for choir, brass quintet and narrators, based on the nonsense verse of Edward Lear. Tickets (£8 adult/Under 12s free) can be obtained by phoning 01952 242617. The ticket includes interval refreshments. 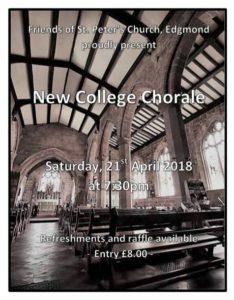 The major concert of the Chorale’s year took place on May 10th 2014 at Shrewsbury Abbey, where the choir has performed several times previously to great acclaim. The Chorale was accompanied by the Orchestra of the Severn and the guest soloist was Shrewsbury –born Adrian Spillett, winner of the BBC Young Musician Competition in 1998 and recently appointed Principal Percussionist with the City of Birmingham Symphony Orchestra. Adrian performed the Concerto for Marimba and string orchestra by Brazilian composer, Ney Rosauro, whose unique style of writing combines charming melodies with catchy rhythms and which uses the rich elements of Brazilian folk music to enchanting effect. The Chorale sang two major works in the concert – Vaughan Williams’s ‘Toward the unknown Region’ and the latest Karl Jenkins choral work, ‘The Peacemakers’, a setting of words of peace from such iconic figures as Gandhi, Nelson Mandela, Martin Luther King, and Mother Teresa. The concert began with the popular ‘Montagues and Capulets’ movement from Prokofiev’s ‘Romeo and Juliet’. 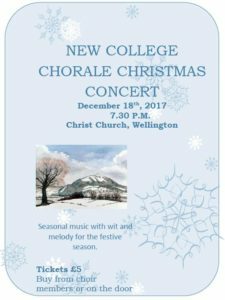 This took the traditional form of nine lessons and carols and will include choral music by Purcell, Vaughan Williams, Herbert Howells, Stanford and Bach. This was an unticketed, free event. The first half includes music by John Rutter, Peter Warlock, Malcolm Archer and Rachmaninov as well as instrumental works by Handel and Vivaldi. The second half features excerpts from Handel’s Messiah.